I spent a couple hours on the OSU campus this afternoon. playing Ingress. There are a dozen or more portals within short distance from one another, so it’s an easy place to build up some quick AP. I was able to earn 50K AP in a little over an hour, thanks to some help from Skyssx. 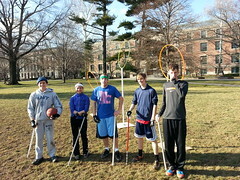 As we were wrapping up on the Oval, we saw some rings standing atop poles, and people running between them with sticks between their legs. 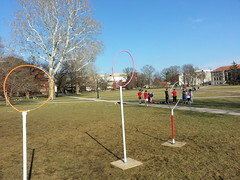 It was the OSU Quidditch team! They were extremely friendly, and very eager to talk about the game. I assumed it was a localized, fairly tongue-in-cheek event, but they told me they’d had tournaments in Indiana and Virginia, and a world tournament was scheduled for later in the year in Florida. Clearly this is a serious sport! It actually looks quite fun!